Can you guess what books we've been reading lately? The bonnet was mine when I was a little girl. My mom made it especially for me, and I had a matching one for my doll. That is a precious picture! Oh that was my guess too. Little House on the Prairie. I'm your latest follower. She's so adorable. What a lovely photo! I'm guessing the Little House series too. I have no clue but this is a lovely photo! She looks adorable! How special that the bonnet was once yours! So cute! My daughter is reading Little House too. She loves it! Very cute! 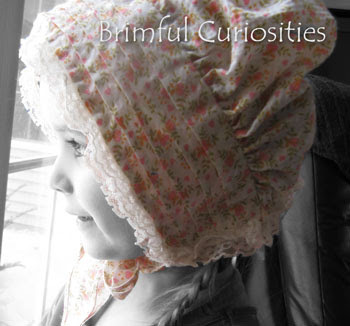 I remember having bonnets like that too! The American Girl dolls or Little House. Adorable...and if it's the Little House books, I loved those!! That is such a precious picture! How neat that you saved it and could share with your little girl! I love your bonnet! So adorable, as is your sweet little girl! What a sweet photo! Very cute! Oh how cute! My kids haven't gotten into the Little House books yet, darn it. Not that I haven't tried! So darling! I love it! I really like that bonnet:) It's adorable! She is too cute in that bonnet! !